Yesterday’s Close: December corn futures finished yesterday’s session up ¼ of a cent, trading in a range of 5 cents. Funds were estimated sellers 4,500 contracts. Fundamentals: The market is in consolidation mode as participants await new news to give us new direction (other than sideways). Estimates are for tomorrows planted acres report come in near 88.56 million, up from 88.03 in the March report. Quarterly stocks estimates are coming in near 5.268 million bushels. Export sales this morning came in at 1,486,700 metric tons, expectations were for 800,000-1,400,000 metric tons. Yesterday’s weekly EIA inventory/production report showed ethanol production increased to 1.072 million barrels per day, 5.6% over last year. Technicals: The market has been trading between our technical support and resistance pockets for the last six sessions; we have had support defined as 369-371 and resistance from 376 ¼-379 ¼. There seems to be a bit of a buyers strike ahead of the report and at the end of the quarter. We are hopeful that we will see the market break out of this recent range and give us a bigger directional move. Yesterday’s Close: November soybean futures finished yesterday’s session up 1 cent, trading in a range of 11 ½ cents. Funds were estimated to have been flat on the day. Fundamentals: The market finished near unchanged yesterday as market participants await tomorrows USDA report. Estimates for planted acres is near 89.69 million acres, up from the 88.98 in the March report. Quarterly stocks estimates are coming in near 1.225 million bushels. Export sales this morning came in at 1,000,800 metric tons, expectations were for 400,000-1,000,000 metric tons. We will likely hear more about trade within the next week as well. A historical side note (for what it’s worth): The market bottomed last year on June 23rd and rallied $1.05 ¼ in the following 12 sessions. Technicals: The market has tightened its trading range over the past two sessions as it appears market participants are unwilling to take a new position with conviction ahead of tomorrow’s report. The bulls want to reclaim 897 ¾-900 ¾ on a closing basis, a failure to do so could take us to new lows. On the resistance side of things, there is not a lot until 921 ¾-923 ½. A close above this pocket will likely encourage additional short covering. The support side seems a little less clear as we linger near uncharted territory. 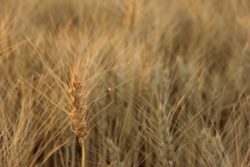 Yesterday’s Close: September wheat futures finished yesterday’s session up 5 cents, trading in a range of 10 ½ cents. Funds were estimated buyers of 5,000 contracts. Fundamentals: Wheat futures are trying to find bullish news to halt the decline but there’s little to be found. Bullish traders are hoping tomorrows USDA report could be the spark for a short covering rally. Estimates for Friday’s quarterly stocks and planted acres report are being digested by the market. Estimates for all wheat acres are near 47.12 million acres, down from 47.34 in the March report. Quarterly stocks are expected to come in near 1.091 million bushels. Export sales this morning came in at 563,700 metric tons, expectations were for 250,000-500,000 metric tons. Technicals: Wheat is fishing for a bottom and we just aren’t sure it has found one just yet. Support from 475 ¾-480 has been holding, but another test could break the camel’s back. A close below this pocket could accelerate the selling and press prices down towards 450 ½-454 ¾. On the resistance side, the bulls want to reclaim ground above 496 ¼-500 to encourage another move higher. That being said, the bears remain in control until consecutive closes above 510 ½-513 ½.